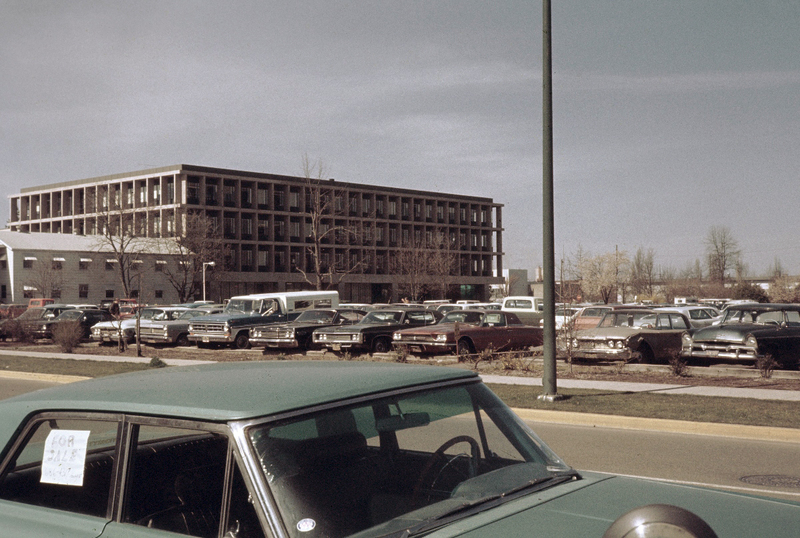 Klamath Hall, c. 1968. Photo: Stanley Bryan. Architect: Skidmore Owings and Merrill. Date: Opened in 1967. This 1967 building was originally called Science II (with the current Pacific Hall being Science I). An architect's model published in Old Oregon 45 no. 4 (Jan.-Feb. 1966), p. 7, shows the clean geometric patterns and shapes, favored in the 1960s, that sometimes look best in small-scale models. The later Science III is now called Huestis Hall. The Science Library (in the Onyx Bridge courtyard) was built as part of the construction of Klamath Hall. [Architect's Model]. Old Oregon 45 no. 4 (Jan.-Feb. 1966), p. 7 ill.
Klamath Hall, Historic Resource Survey Form. University of Oregon Cultural Resources Survey, 2006.